EMC alumnus Ryan Skelley worked for three summers as an intern aboard the Nautilus, and he’s now a paid employee. Imagine yourself visiting exotic locations aboard a world-class scientific research ship, exploring the ocean depths via remote video cameras. Sunken ships, deep-sea creatures and possibly even sunken treasure await. The Nautilus Science and Engineering Internship Program aims to train undergraduate and graduate students studying ocean science, engineering and video/film in the at-sea environment. 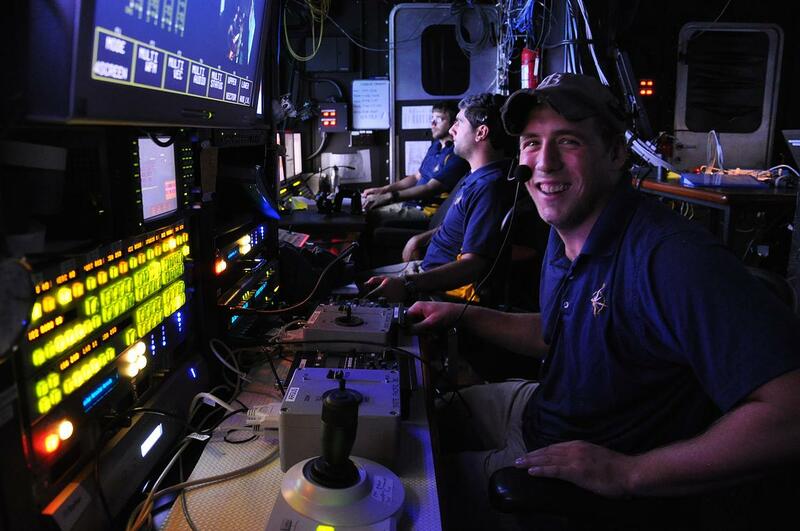 Intern positions entail 2-5 week periods working aboard E/V Nautilus as data loggers, ROV pilots or video engineers. For many years, recently retired Electronic Media Communication (EMC) Professor Mary Nichols has worked during the summer months aboard the Exploration Vehicle (E/V) Nautilus, a 64-meter scientific research vehicle. The leader of this mission is Dr. Robert Ballard, best known for his 1985 discovery of the RMS Titanic. Internships are available for EMC students. Many EMC students have taken advantage of this great opportunity in the past, including alumnus Nic Dugger, who now runs Tennessee Digital Video (TNDV). Applications will close Jan. 16, 2016. Apply now for 2016 internships by clicking here.